The Samsung NC10 comes with a default 1gb RAM. This is actually a fair quantity and to be honest this will be plenty enough for many users. However some of us will be looking to push our Sammy Netbooks a little further and run some more resource hungry applications. If you fall into this category then upgrading the NC10 Ram may be a good option for you. For example I am currently copying over a large virtual hard disk to run with Virtual PC. Others have installed high end graphics packages or perhaps you are the type that likes to have 100 Internet Explorer tabs open at once! Adding that extra 1gb will help all these things. Thankfully upgrading the NC10 memory to 2gb is a fairly straight forward and relatively cheap process. Especially for those of you who remember how expensive RAM has been historically! First of all as a general disclaimer I want to warn you that opening up your Samsung NC10 will involve a risk. Admittedly a small risk. This netbook has a built in access hatch which makes the process as straight forward as can be so it is unlikely you will damage your netbook. However it is always worth taking time and care over such a process. Check with Samsung if you are concerned about affecting your netbook warranty. One SammyNetbook member got the following response – note that it was from Samsung UK so if you live elsewhere please check! Always handle RAM with care. These chips are very sensitive to static so remember to take the normal precautions. Read the official manual and check Samsung’s official installation guide, if in doubt that should be your overriding guide. Allows smooth multi tasking. You can have many applications open at once and can switch between them with ease! Possible increase in power use, but unlikely to make a noticeable difference in battery longevity. Longer to come in and out of hibernation mode. Might not see a big difference in performance if you only use your NC10 for light computing tasks. Note: Guide updated to reflect the screwdriver head required. Please check out the discussion on which screwdriver to use, some people have found that they have stripped the screw head so please take care. Remove the screw holding the upgrade hatch in place on the underside of your NC10. Pry open the hatch. I found that the cover came off very easily just by peeling it away. However some NC10 owners have reported that it was quite tricky to remove. If this is the case I’d advise continuing cautiously as excessive force could cause damage, if in doubt – talk to Samsung! Remove your existing 1gb chip, there is only one slot so this needs to be replaced with your new 2gb upgrade. This can then be removed by applying light pressure to the clips on the side and then the chip should spring upwards and can then be gently slid out from the socket. Note that this should not need much force so if you find the chip is stuck you may be doing something wrong. Once you have removed the existing chip, store it carefully away. It is unlikely you’ll need it again but I’d hang onto it. You are ready to slot the replacement 2gb Ram upgrade into your Samsung NC10 netbook. Position the chip so that the teeth are facing the slot and the groove on the memory chip aligns with the notch in the slot. Power on your NC10. If the netbook fails to boot, remove the battery to kill the power and open up the upgrade hatch again. 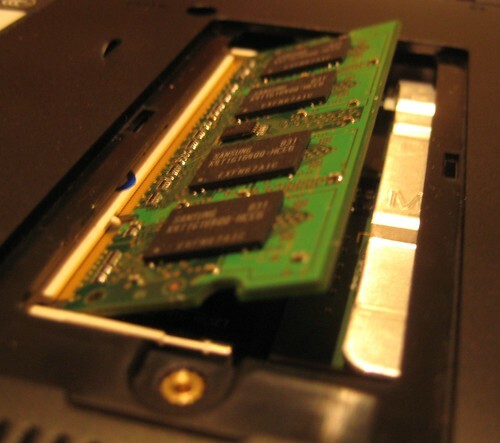 Your new DIMM is either installed incorrectly or you may have the wrong type. If all is OK then hit the F2 key right away to enter the BIOS and from the main tab you should see the new amount of RAM. Feel free to download the Sandra memory benchmark results if you are technically minded. I couldn’t tell much from them as in most cases the results looked very similar. Notably it did report higher power usage and appeared slightly slower in some tests but I can’t help feeling the difference are negligible and the extra RAM more than makes up for any difference in observed performance! Decided to Upgrade NC10 Ram? Read and digested all that? Interested in going for the NC10 Ram upgrade? Click here for USA or Click here for the UK! Have you upgraded already – how did you get on? Any notable difference? Apologies for the problems viewing this page – looks like a cache error! Let me know if it happens again! Important question. How (if any) does this affect the battery life? A 2GB module should consume more power than 1GB but how much more? Is it negligable? The benchmarks in that zip file in the article has some power stats. It reports a very small difference. I can’t say that I’ve noted any big changes in power consumption but then I have done no “scientific” test on that respect. Maybe I’ll try a full power run down over the weekend. I followed the instructions exactly as indicated, and with then new 2G installed (exactly the brand, mhz, in the picture) when I push the F2 Key, I get still 1024 mb as the memory. So I started again, put back the original memory, 1gb, and got 1024mb again. So I installed the 2G Ram a second time, and still the same thing. Am I doing something wrong? or could the Ram memory be defective? Any help/suggestions you can offer would be appreciated. (I only bought the entire thing yesterday, including Ram). And it even says “2 GB” on the front of your pack? That doesn’t sound correct to me. Does the machine boot OK with the new RAM? And if you right click on My Computer->System Properties->General does is say 1gb there too? Perhaps they have sent you a 1G module by mistake? I have just checked mine and it definitely says 2048mb so you should see that in the BIOS. If no one else here has any other suggestions I think you will have to send it back to your supplier and inform them that it is the wrong size. Thanks for your suggestinn. I looked in the System Properties, and it says .99 Go of Ram (I assume it’s using some at this point). The blister pack definately says 2 GB, and the actual piece of RAM is different from the one that is originally supplied, in that the original RAM has a row of 4 squares on each side of the RAM (total = 8), where the 2G (new) one has 8 squares on each side of the RAM (total 16). Is it possible that there is a tech default in the new RAM and one ‘side’ is not being recognised/funtioning correctly? As for the physical size, it fits in perfectly to the slot. When I installed mine it was as simple as slotting in the 2Gb chip and it recognised it straight away with no further action required. Hello sammy, I want to know if there are netbooks that come with RAM of 2G (without having to upgrade). I need a portable netbook, but my requirements are beyond 1G and I don’t want to upgrade a 1G. Pls I need you to reply asap. Thanks. I prefer Toshiba or Dell or Apple, but if U think there is a better one, I am open to change. Hi Ennie, there are lots of good netbooks on the market and to be honest I only really follow the Samsung models. However I certainly would recommend them and I’ve been very happy with mine. I believe that there are certain Samsung netbooks that come with 2gb RAM – perhaps ask if anyone has seen any in the shops on the forum here. For example the NB30 Pro. 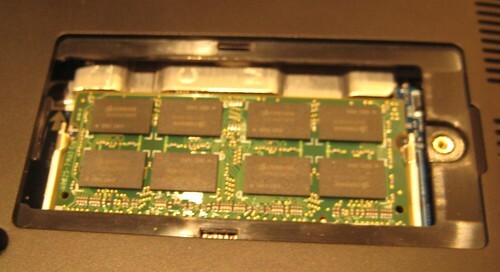 The upgrade is very easy to do yourself, there is a hatch on the rear of your netbook that the new RAM slots into. Alternatively some shops will fit it for you whilst you wait – often for free or a small charge. Just upgraded mine and it went perfectly thanks to this guide!! 2gb won’t change your world but it makes the netbook a little zippier. It’s worth doing for the amount it costs but don’t expect miracles! CS (the original) should run, but it’s not much fun to play on a 10″ screen! Just upgraded using the advised Corsair module. All went well & have noticed a marked improvement in performance. 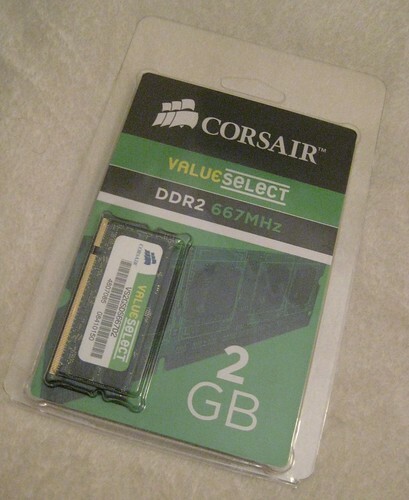 I hope this is the right place to ask this- I would love a 4GB 200-pin SODIMM DDR2 PC2-5300 Memory Module for my NC10. 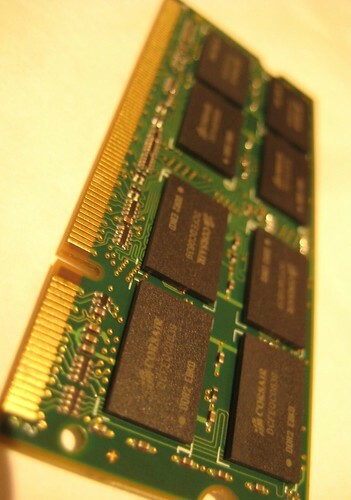 When the netbook came out, 2GB 200-pin SODIMM DDR2 PC2-5300 were the highest sized memory that were made AFAIK. It made sense that 2GB was the recommended maximum. Now I see 4GB out, and all the other specs match up. But perhaps there is some other factor that limits the available memory? I see recommendations for old Macbooks that took 2GB DDR2s, might the new 4Gs also work in netbooks? And can I do this with XP, or will only W7 and linux will use >2G? I believe the limitation is on the m/b and others have bought and tried 4gb chips without success, have a search of the forum, you’ll find a few posts on the topic. Had to be very careful removing the hatch upgrading to 2GB. The pros and cons you mention are spot on; except for the startup time from stand-by or sleep mode. Even with lots of applications running and a memory allocation of well over 1GB, I did not notice an increase in start up time. A well spend 30 euro’s. Previous post: SammyNetbook NC10 community site and blog: The first two weeks!